Guest post by Libby Hall, digital strategist at the Flint Group of agencies. Here’s an example of strategic social media in action for our client, SunButter. SunButter sunflower seed spread is like peanut butter, but totally peanut-free and made from sunflower seeds, so it’s perfect for people with peanut allergies. It’s also delicious, as fans on the Internet will attest. These were the kind of conversations we found when we started listening to people talking about SunButter in 2010. The only way to explain how positive the results were is to say that people are crazy about this stuff. We’re extremely fortunate to work with a client that is so well-loved by such a passionate fan base. It was a logical next step to create a social media strategy that turned these fans into SunButter advocates. Positive social mentions. As you’ll read on page 164 of The Now Revolution (because you all have a copy of the book, right? ), when you’re measuring loyalty and advocacy, positive and neutral mentions are what matter. Negative mentions are obviously important, but for other reasons. Interactions. Generally, if your strategy is loyalty, interactions with posted content are a pretty solid measurement. Comments on blog posts or Likes on Facebook updates count in this category. Referral visits to website. Normally website traffic doesn’t mean much for CPG. I don’t have to visit Skittles.com before I buy a bag of Skittles. But although SunButter’s distribution is growing, it’s still not available in every store, and the most frequently asked question we hear is, “Where can I buy it?” So social traffic to the website became an important metric to determine whether fans were spreading the word about where to buy SunButter. The blog on SunButter.com is our home base, where we’d ideally like to interact with all fans. Blog posts range from recipes, to guest posts from our favorite peanut allergy bloggers, to ideas for “royal snacks” for the royal wedding. Outposts were set up where we saw conversations happening – namely Facebook and Twitter. SunButter offers a helping hand by answering questions about peanut allergies in spaces like Twitter, Yahoo Answers, and Babycenter. Elizabeth, the voice of SunButter in social media, excels at entering the conversation gracefully. She focuses on answering the question, not selling the product. 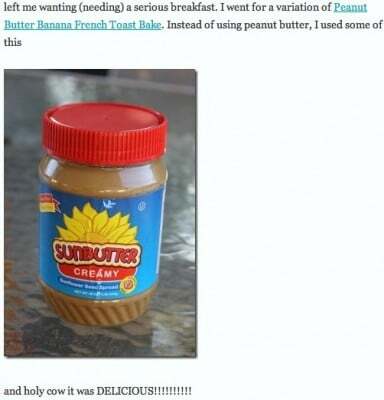 Besides answering questions, Elizabeth is quick to comment on blog posts that mention SunButter. She befriends many of these bloggers, and several write guest posts for the SunButter blog. Our best blog posts come from ideas we get straight from our fans. When we used Facebook Questions to ask fans for their favorite way to enjoy SunButter, they told us that sandwiches top their list. Their creative ideas evolved into this post on the best SunButter sandwiches. When SunButter launched a no-stir variety in February 2011, we enlisted SunButter’s blogger friends to help spread the word. We sent a few of them a Valentine’s Day care package, with a jar of No-Stir SunButter, a few heart-shaped cookie cutters, and a quick note to encourage them to bake something delicious and let us know the results. We also reminded them that if they chose to write a blog post about No-Stir, to please mention that they’d gotten the product for free, as FTC regulations require. Of our 10 blogger valentines, 6 wrote positive posts about the new variety and their SunButter creations. Not only did we get the message out to their readers about the No-Stir variety, we got fantastic new ideas to add to our recipe box. We were able to launch No-Stir directly to our most loyal and influential audience – all because of the connections SunButter had created through social media. We’ve seen positive results for all key metrics, which you can find in the Slideshare below. The most important result? Sales have increased measurably since SunButter has embraced social media. View more presentations from Flint Group. Your turn to share. How has your business succeeded because of social media?